This page features news items from 2009. 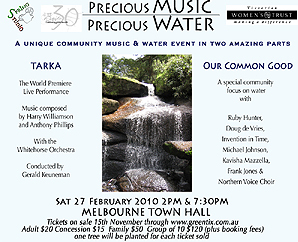 Ant and Harry Williamson's large-scale orchestral work Tarka is due to receive it's World Premier live performance in Melbourne Australia in February 2010 as part of a unique Community Music and Water Event called Precious Music, Precious Water. Ant has assisted with the preparation and checking of the scores for the concert as some parts from the original required re-scoring. Ant is unfortunately unable to attend the concert so his original parts will be played by guitarist Doug De Vries alongside Harry Williamson. Doug and Harry will be joint soloists with the Whitehorse Orchestra, (conducted by Gerald Keuneman) for the performance of Tarka. The concert is taking place at the Melbourne Town Hall on 27th February 2010 and there will be two performances at 2 pm and 7.30 pm. Tickets for the event are on sale now from the Australian Green Tix site - here are direct links to buy tickets for the afternoon and evening performances. Ant has recently played 12-string guitar on a session for Steve Hackett's new album Out of the Tunnel's Mouth. You can read more about Ant's appearance on the album on Steve's blog where a short sound clip of one of the tracks that Ant has played on can also be heard. Originally scheduled for release on October 5th on Steve's new Wolfwork label, the album was delayed for legal reasons. However, the good news is that the album has now been released. The album is also being sold at the shows on Steve's current tour. 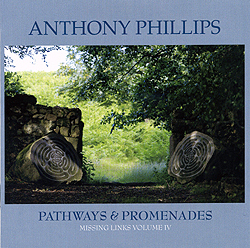 Missing Links Volume 4: Pathways and Promenades is released by Voiceprint on 2nd November. The album brings together for the first time most of the tracks that Ant has written and recorded over the years that have only ever been released on compilation albums. With most of the compilations now long out-of-print and increasingly hard to find, Pathways and Promenades provides an excellent opportunity for these particular Missing Links to be heard once again. Complementing the tracks only previously released on the compilations are some choice tracks from Ant's extensive Library music output which receive their first commercial release here alongside the previously unreleased track Haylcon Days. More information and the track listing for the album can be seen on a new page here. We've now uploaded our own YouTube promo clip for the album here which features sound clips from selected tracks. 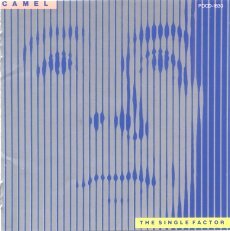 Camel's 1982 album The Single Factor (which has been unavailable in the UK for some time) was re-issued by Esoteric Recordings on 28th September. The reissue has been re-mastered from the original master tapes and also includes the rare edited promotional version of You Are the One as a bonus track. Ant plays on five tracks on the album, including End Peace which he co-wrote with Andy Latimer. The Single Factor is available to order at Amazon. The latest issue of the UK music magazine Prog (an offshoot title from the monthly Classic Rock) which has just been published contains a half-page interview feature with Ant to accompany a feature about Steve Hackett. We've now added the details of the tuning that Ant used on Private Parts & Pieces V: Twelve to the feature item detailing some of the various guitar tunings that Ant has used on different albums. The feature can read here. Following on from the re-issue of Open Secret, Voiceprint are releasing Forgotten Language of the Heart, a 2CD collection drawn from Asher's back catalogue on 13th April. Featuring 37 tracks (including five taken from the albums that Ant produced for Asher), Forgotten Language of the Heart retails for the price of a single CD and is an excellent introduction to Asher's music. It is with great sadness that we have learnt of the untimely death of former Genesis drummer John Mayhew. According to a local press report, John passed away on March 26th as the result of a heart-related condition. Voiceprint Records have recently re-issued Asher Quinn's debut solo album Open Secret. The album, which was originally released in 1987, was produced and arranged with Ant and was recorded at Ant's studio. It also features guest appearances by Andy Latimer of Camel and Tony Freer of The Enid. The Voiceprint Records re-issue of Open Secret has new artwork and also features five bonus tracks, including three songs (The Power of Love, Song of the Morning and Shine Brightly) recorded during the original sessions for the album. The first two songs have never previously been released in any form and all three tracks have been newly mixed from the original multi-track masters from Ant's archives for inclusion on the re-issue. More information about the book can be seen on the Sort Of Books site. Chris' first three books (Driving Over Lemons, A Parrot In The Pepper Tree and The Almond Blossom Appreciation Society) are also being re-issued at the same time with new cover designs and are being marketed as the 'Lemons Trilogy'.